How much is enough? Seriously, have you ever really asked yourself that question? What exactly does enough look like for you? Most of us spend year after year toiling away in a career. We do it to pay our bills, to buy toys, to do fun things, and to keep our families healthy. But how many of us can say for sure when we’ve earned enough, achieved enough, or accumulated enough? Probably not many. Most of us pursue promotions, raises and recognition without ever knowing what the end point is. Where is the finish line? How tall is the ladder? And when does it become enough? I’m not suggesting that we stop pursuing our personal goals–enough is not synonymous with apathy by any means. I’m simply suggesting that we invest time to explore our own definition of enough so that we can design our lives to experience more joy. Isn’t that what we’re seeking, after all? One of the best examples of defining enough relates to our financial health. It’s easy to see the value of budgeting, and most of us understand the need to balance our earning with our spending. That’s simple math. And this practice also prompts us to ask ourselves insightful questions like How much do I need to pay my bills? How much will I need to send my children through college? How much will I need for retirement? Having clear targets when it comes to our finances can have a huge payoff. And it’s the same for other areas of our health. As a self-care exercise, I spent some time exploring my enough. I asked myself some hard questions about what I really, really, really needed to be happy. If I had to leave my home in 24 hours what would I take with me? If I lived in a home that was less than 500 square feet, what would I want in it? How much quiet time do I require to fully recharge my batteries? How much sleep is enough? How much physical activity is enough? And on and on and on. Defining our enough is about understanding the connection between our needs and wants. Some call it contentment; others call it fulfillment. However you choose to label it, wouldn’t it be great to know when you’ve acquired it so you can celebrate it? Want to read all 366 days of this challenge in a convenient eBook? 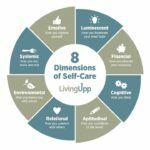 Ready to design a self-care practice that you love? This entry was posted in Self-Care Challenge and tagged aptitudinal, cognitive, financial, luminescent.